To be honest, it’s really hard to like something after reviewing the absurdly well-built HP’s ProBook 440 lineup because it covers all basic needs of a businessman while offering a little something on the side. 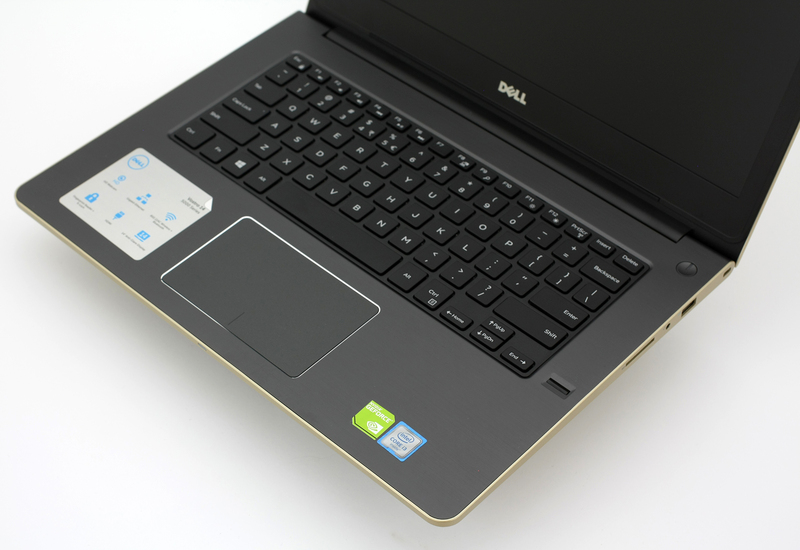 Dell’s direct answer to the ProBooks, however, are the Vostro series, more particularly the 14-incher we have here for a review. It falls into the same price range but lacks some of the perks the ProBook 440 G3 has – for instance M.2 SATA SSD support. However, the Vostro 14 5000 series make a compelling choice with key selling points on the portability, design, and rigidity. It will be interesting to see how it stacks against the ProBook 440 G3 in terms of display quality, GPU performance, and battery life since those are the main aspects setting these two apart. Let’s see if the Vostro 5459 is up for the challenge. The containing box doesn’t offer anything out of the ordinary – just the usual user manuals, AC adapter, power cord and the notebook itself. 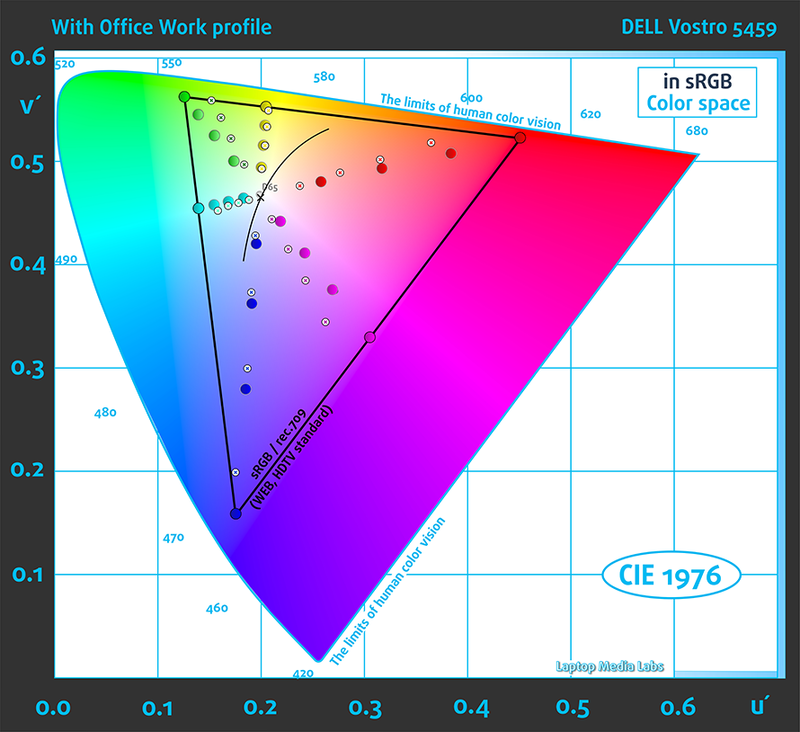 As we already said, the Vostro 5459 is mostly design-centric device and by the looks of it, you can clearly see why. The lid and interior feature brushed aluminum plate while only the bottom piece is made of plastic. It definitely brings a nice and refreshing touch to this entry-level business companion and also keeps the weight relatively low. The device is 1.7 kg and just 18.5 mm thick so if portability is a top priority for you, the 14-inch Vostro 5459 is an excellent choice. Let’s begin with the lid. It’s made of brushed aluminum plate, which looks flexible at first but bending it doesn’t cause major distortions on the LCD screen. 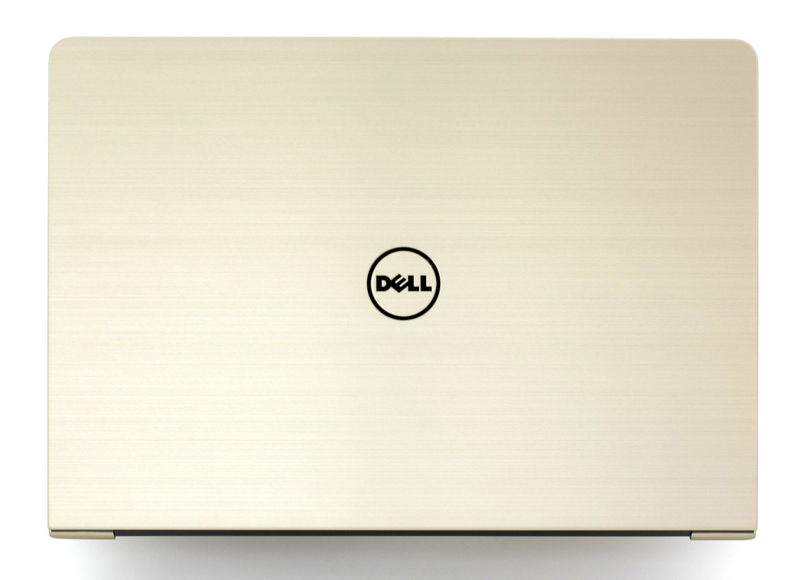 Also, the color we got for the review looks pretty nice – something resembling champagne gold. The screen is supported by a big hinge spanning across the width of the base and that’s where the main exhaust vent is located. The hinge is made of plastic and feels a bit too stiff making it hard to open the machine with one hand but this will come in handy to the touch-enabled variant as it will eliminate the annoying screen wobbling to some extent. And as for the bottom, it’s entirely made of plastic with the same gold-ish color and a few extra vent openings for better airflow. It’s held by a number of screws that need to be removed in order to access the hardware inside. But more on that in the next section of the review. The sides are flat and connect to the interior seamlessly. No gaps or holes are to be seen. We are also happy with the port distribution because most of the connectors are positioned on the left clearing up enough space for the external mouse on the right. They are as follows: left – DC charging connector, HDMI, RJ-45 for wired LAN connection and two USB 3.0 while on the right – SD card reader, USB 2.0, 3.5 mm audio jack. 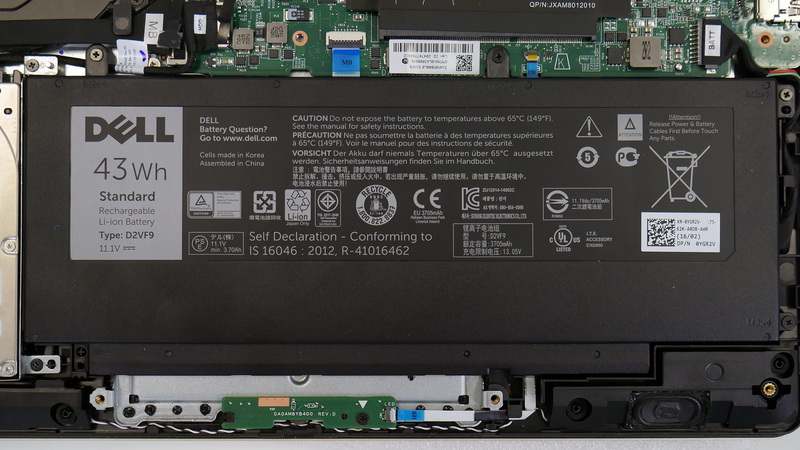 As a business notebook, the Vostro 5459 should impress with excellently designed interior accompanied by comfortable and accurate input devices. And for the most part, the laptop delivers. We’ve got again brushed aluminum surface surrounding the touchpad and keyboard but with a dark gray color contrasting to the outer chassis. Anyway, the touchpad feels extremely light and comfortable to use. Left and right clicks are registered correctly, swipes and gestures are on spot and so does the overall touchpad experience. Quite frankly, we can’t say anything bad about it and we can even say we liked it more than the one on the HP ProBook 440 G3, which adopts a more old school design with dedicated mouse buttons. Usually, this is the better way to go on low-end devices but the Vostro 5459 surprises with a stable and accurate surface. However, we aren’t as happy with the keyboard. Slightly bigger keys would have been appreciated but the spacing is good. Some of the keys at the edge of the keyboard tray feel a bit mushy – probably because of the plastic tray – and the key travel doesn’t feel very “convincing”. The ProBook 440 G3 definitely takes the lead on this one. In any case, for the asking price the Vostro 5459 delivers more than you’d expect – it’s quite thin, portable and rigid featuring mostly aluminum. It also features great touchpad design and healthy port distribution, however, there’s some room for improvement when it comes to the typing experience. The Vostro 5459 is rather easy to disassemble and you will only need a screw and a plastic tool to pry up the bottom plate as shown in the photos below. 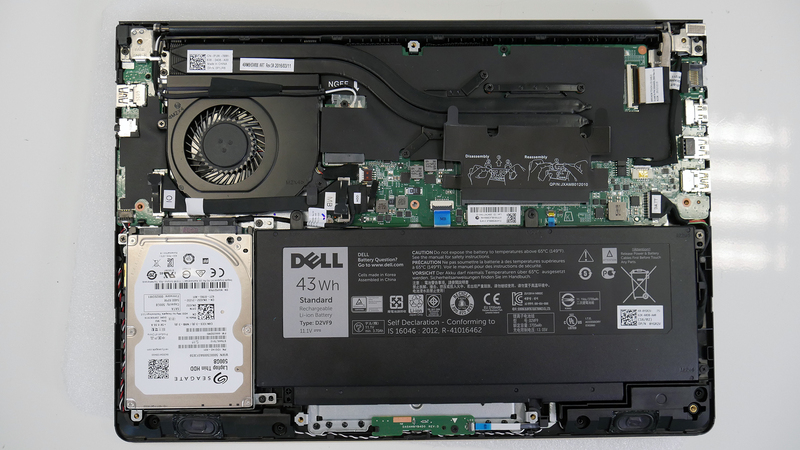 Like most budget-oriented devices, the Vostro 5459 features only one 2.5-inch HDD and no M.2 SSD support, although the HP ProBook 440 G3 has one and holds an edge over Dell’s offering as far as storage options are concerned. 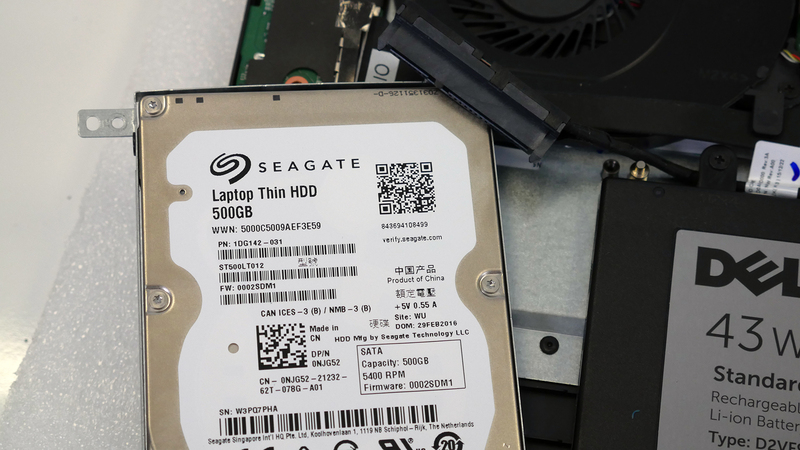 The HDD is Seagate-made with 500GB capacity. The motherboard supports only one DDR3L-1600 chip and the maximum supported memory is 8GB, although our unit came with a small 4GB SK Hynix chip. 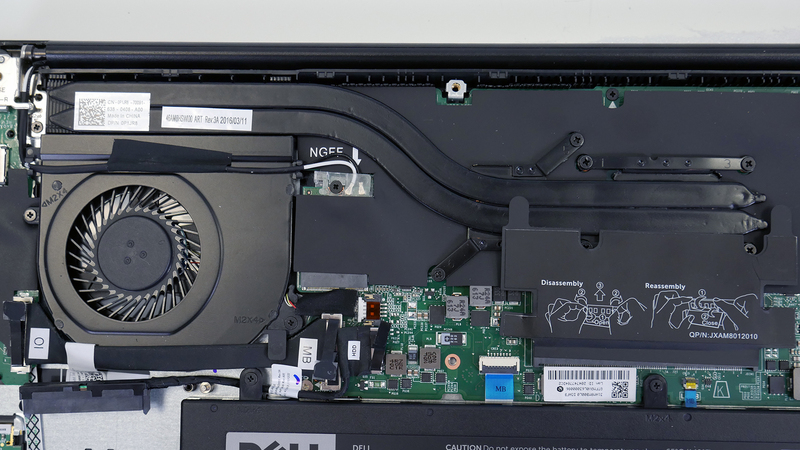 The Wi-Fi card can be found right next to the cooling fan and it’s made by Intel with model number 3165NGW. 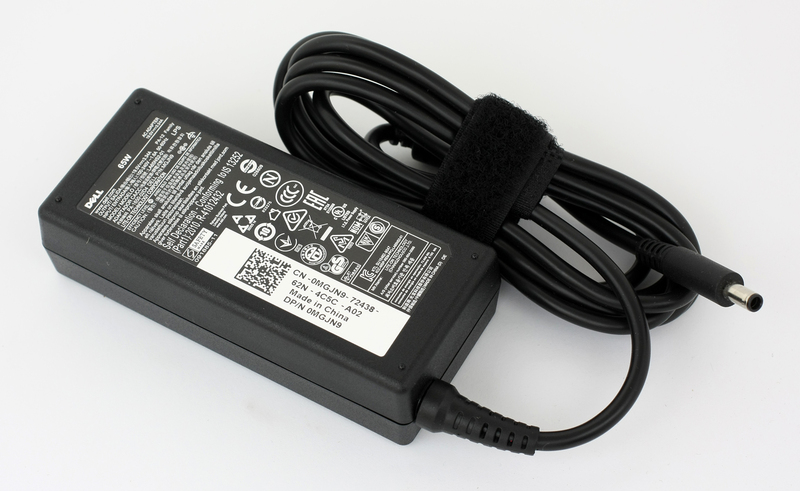 The battery unit is rated at 43Wh and can be easily replaced. The cooling system isn’t anything out of the ordinary. It consists of two heat pipes connected to the cooling fan, which, by the way, looks a bit big but it’s perfectly capable of keeping the internals cool. The Skylake-U chip and the GeForce 930M GPU aren’t as demanding even under high load. 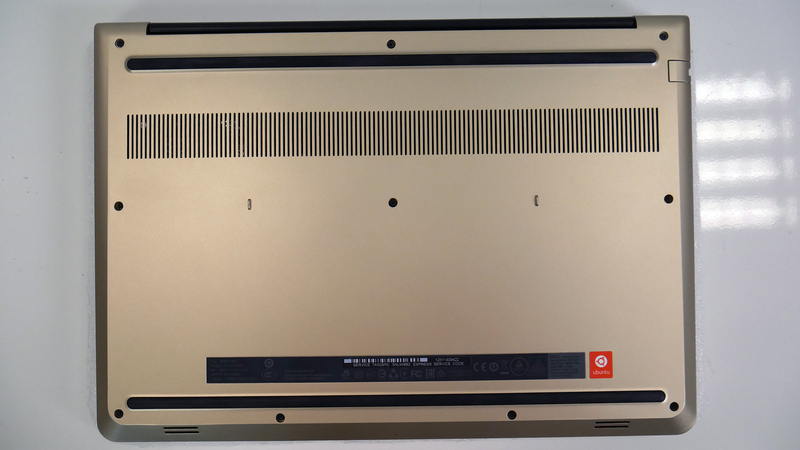 The notebook we’ve tested uses a WXGA TN panel with 1366 x 768 resolution in a 14-inch diagonal leading to a pixel density of 112 ppi and pixel pitch of 0.227 x 0.227 mm. It’s manufactured by BOE with model number DP36C. It can be considered as “Retina” if viewed from a distance equal or greater than 80 cm. Viewing angles aren’t good due to the use of TN matrix. Here’s how colors shift under a 45-degree angle. The maximum brightness is a bit low – 206 cd/m2 and 201 cd/m2 as an average across the surface with only 5% deviation. Color temperature is 7590K in the middle and 7390K as average, which is considerably more than the optimal 6500K so colors may appear a bit blue-ish and cold. The contrast ratio is also low – 250:1. Anyway, the maximum color deviation dE2000 is just 1.3 in the bottom center part of the screen. 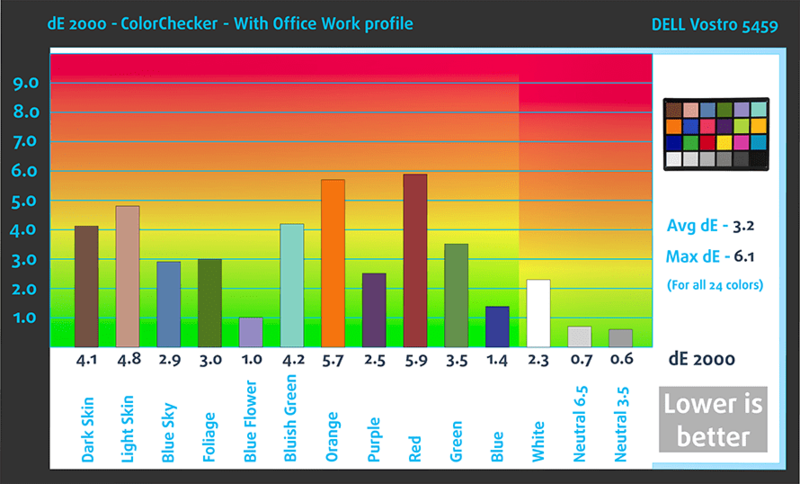 This is an excellent result as values above 4.0 are unwanted. We’ve recorded merely 55% coverage of the sRGB gamut but that’s rather common at this price range. OEMs tend to use budget TN panels for their entry-level models. We’ve set the profile at 140 cd/m2, 6500K white point and sRGB gamma mode. We recorded Fall Time + Rise Time = 10 ms. Unfortunately, we’ve recorded aggressive pulsations (300 Hz) from 0 to 99% brightness so we don’t recommend using the screen for longer periods of time if you are not planning to set the display at 100% luminance. And with just 200 nits of maximum brightness, you will probably find it comfortable to use at 100% brightness for most of the time. As expected, the model doesn’t excel in display quality due to the budget TN panel used for this configuration. Its properties don’t make it good for multimedia purposes but it will do just fine for general browsing and office work. Still, the low maximum brightness and contrast ratio might be a deal-breaker for some. Moreover, the panel uses PWM at extremely low frequency (300 Hz) so if you are planning to use it for long periods of time, we suggest installing our Health-Guard profile or just pair it with an external monitor in order to keep your eyes safe. No distortions were noticed throughout all frequencies. The maximum allowed volume is satisfactory. 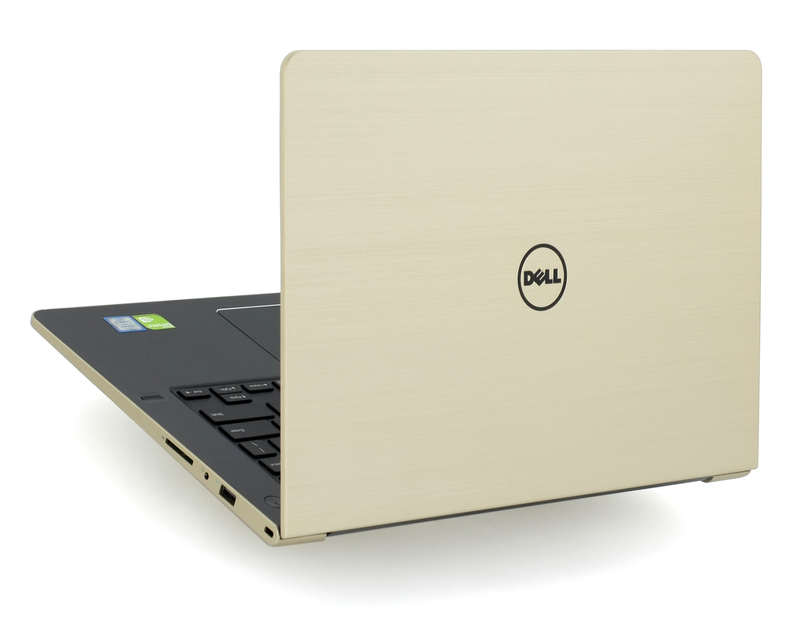 We used a freshly installed Windows 10 (64-bit) for our testing and if you wish to perform a clean install of the OS as well, we suggest downloading the latest drivers from Dell’s official support page. We didn’t get any record-breaking results on the battery tests but that was expected. Still, the 43Wh unit performed well and even put up a fight against the ProBook 440 G3, which scored a bit better than the Vostro 5459. Of course, all tests were performed using the usual settings – Windows battery saving feature turned on, screen brightness set to 120 cd/m2 and Wi-Fi running all the time. Probably the most important test and the notebook got 395 minutes (6 hours and 35 minutes). Interistingly, the laptop scored slightly better in our video playback test – 407 minutes (6 hours and 47 minutes). It’s quite unlikely that you will start a gaming session without being close to a power source, but it’s good to know that you can play for more an hour – 175 minutes (2 hours and 55 minutes). The Intel Core i3-6100U is part of the Skylake generation processors from Intel and also representing the ULV (ultra low voltage) series. The chip doesn’t support the Turbo Boost feature for dynamic frequency adjustment but has the important Hyper-Threading feature that emulates one virtual core for each physical one and thus establishing up to four threads. The two clocks run at 2.3 GHz and they are manufactured using the 14nm FinFET process. The CPU also includes the Intel HD Graphics 520 iGPU and GT2 being its code name. It has 24 EUs (Execution Units) and are clocked at 300 MHz and can go up to 1000 MHz. The whole SoC draws approximately 15W at full throttle and that includes the memory controller (DDR4-2133/DDR3L-1600), the CPU and the iGPU. The chip also supports cTDP down so the TDP can go as low as 7.5W but that depends on the OEM and it affects heat dispersion and performance. Fritz is a chess benchmark that tests the computing capabilities of the CPU with various chess moves. The Intel Core i3-6100U reached 4.725 million moves per second. By comparison, one of the most powerful PCs, Deep(er) Blue, was able to squeeze out 200 million moves per second. In 1997 Deep(er) Blue even beat the famous Garry Kasparov with 3.5 to 2.5. The two-staged stress test that we perform isn’t a good representation of real-life usage since it’s impossible for the general user to reach such high loads but it’s the best way to determine the stability of the system in the long run, especially the cooling design. We started with a 100% CPU load for an hour and things looked pretty good. 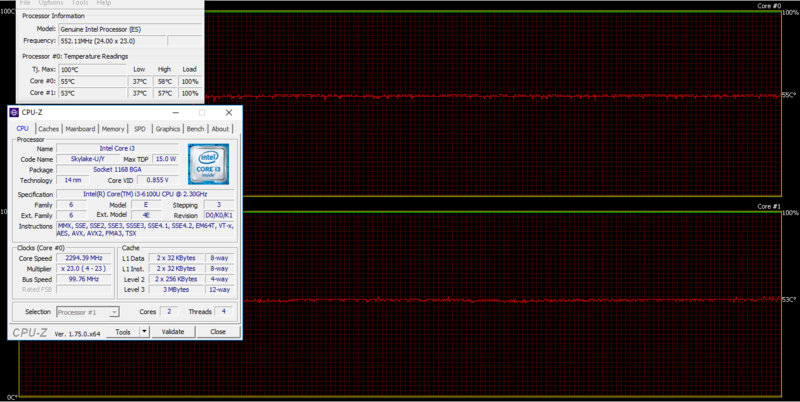 The CPU ran at its maximum 2.3 GHz while the temperatures were pretty low. 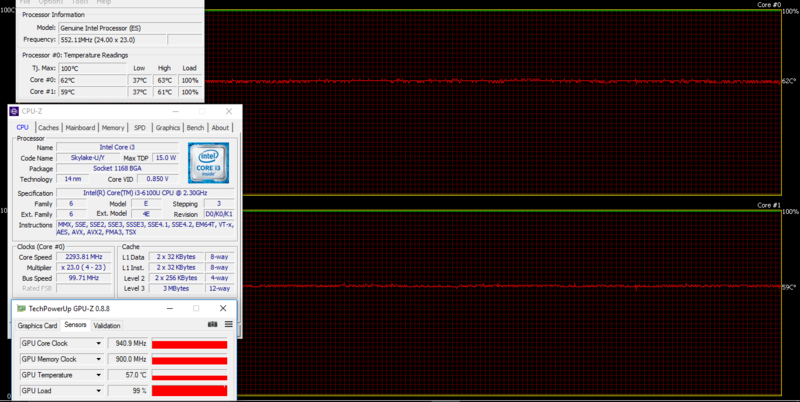 When we turned on the GPU stress test as well, the CPU temperatures remained stable along with the clocks. Also, the system was able to utilize the full performance of the GPU. The surface temperatures were low even after the long stress test. 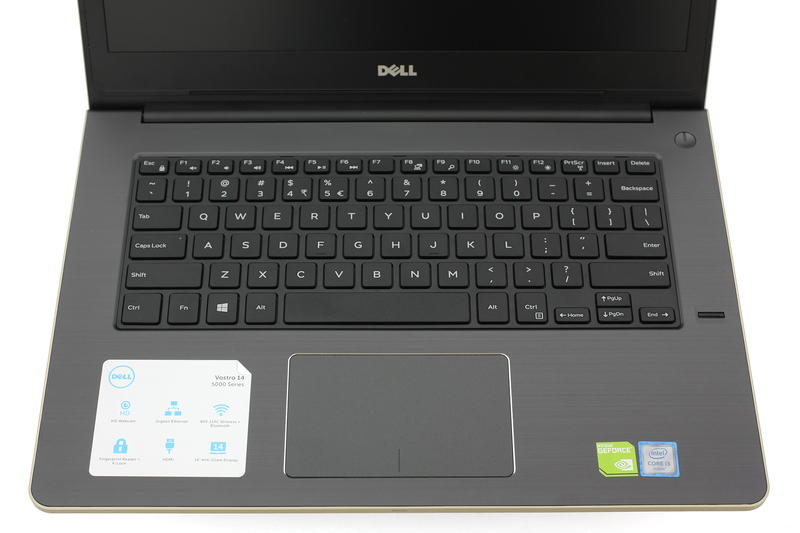 Dell was able to build a solid all-rounder for the asking price but to be honest, it’s really hard to compete against the HP ProBook series, which happen to have a 14-inch model as well. It has slightly better battery life, better input devices, more storage options including M.2 SATA SSD support and arguably better hardware (CPU and GPU) depending on the configuration. 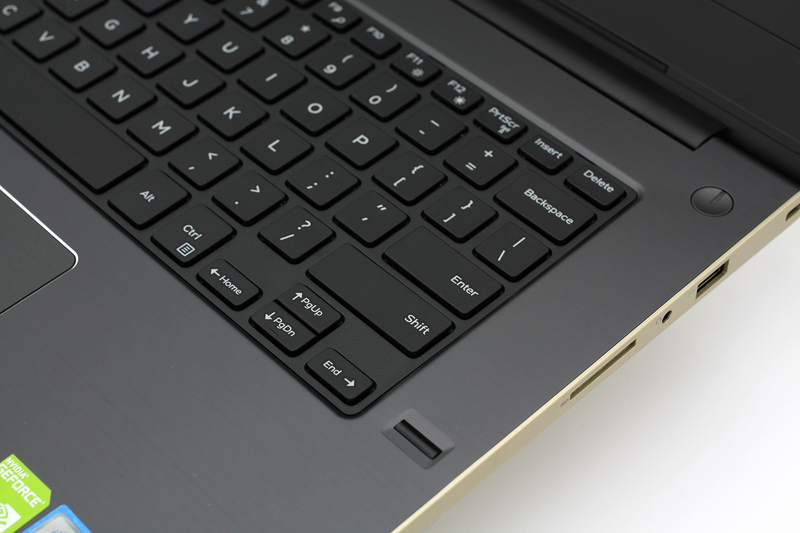 However, the Vostro 5459 makes a compelling choice with rigid construction, refreshing design and comfortable touchpad leaving only the keyboard with some room for improvement. It’s also pretty portable and slim given the price point. Our only major complaint about the screen is the use of an aggressive form of PWM across all brightness levels (except 100%). 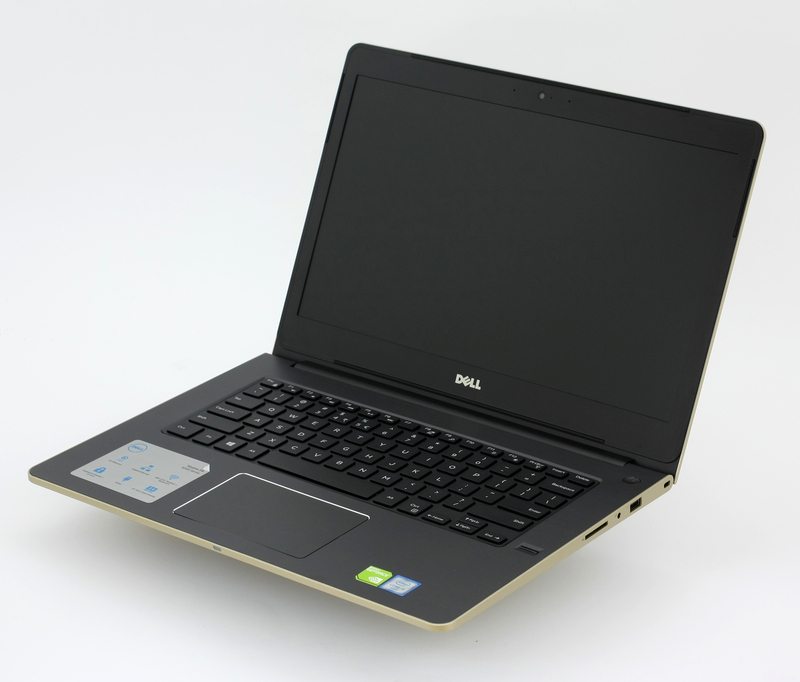 But generally, it has the same properties as its direct rival, the ProBook 440 G3. 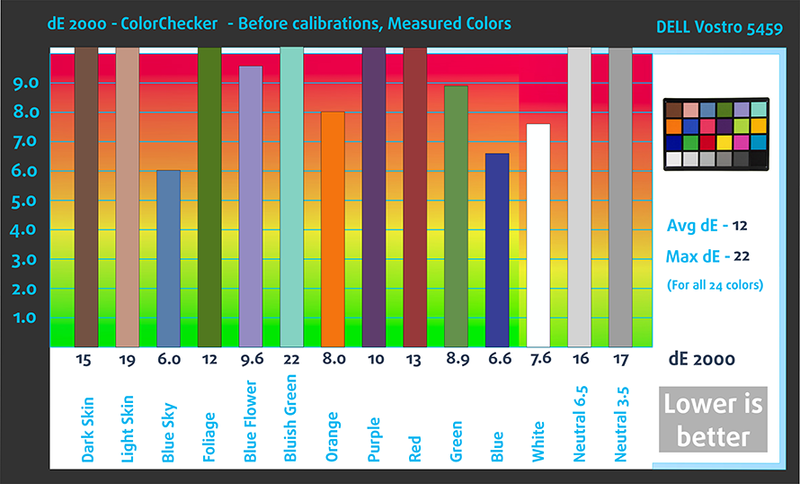 Good thing that our Health-Guard profile can eliminate the negative pulsations and also limit the blue light emissions. Finally, the battery performance is pretty good for an entry-level device despite the fact that it falls behind HP’s budget solution by a tad. So if you are strictly looking for a 14-inch laptop, probably you’re better off with the budget configurations of the HP ProBook 440 G3 or if you even have a bit more cash to spare, you can look for the budget Acer TravelMate X349-M configuration with the same sreen specs and the same processor (Core i3-6100U). Hi! 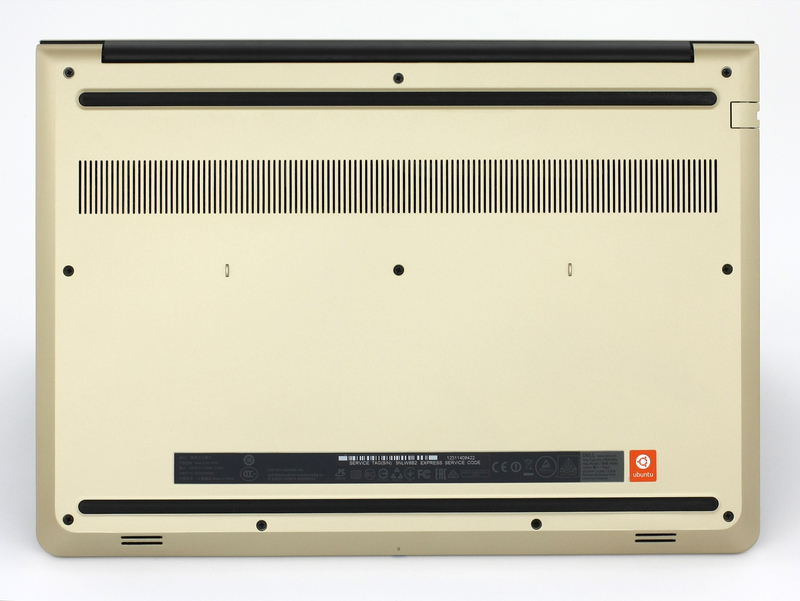 In my region there’s a version with a FHD, IPS, Matt display. Have You had an occasion to look at that model and have any comments on the quality of this display versus the regular TN? Thanks!